Play these Flash or HTML5 based online slot machine games provided by Win A Day at Top Free Slots. No download required to play the games - just click on the image and wait for the game to be loaded in your browser window. You can play all these Win A Day Slots for free or try your luck for real money at sponsored online casinos. You can play classic slots or 5 reel video slots with multiple lines of payout, exciting bonus features, and wild and scatter symbols to increase your winning potential. 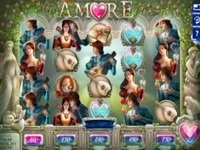 Love is blooming in this Romeo & Juliet themed slot machine game, following the world’s most famous romantics. 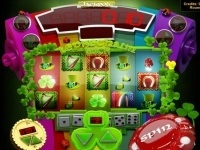 The attractive slot and imaginative theme of the game is uniquely designed for WinADay and can be played on no other..
Leprechaun Luck is a 5 reel, 31 payline slot machine featuring Wild and Double Wild symbols, a Cauldron bonus and an adventurous Bonus Game. The Leprechaun's treasures are right in front of you with this new slot game.. Experience the fun of shopping at a luxurious mall with one of the best slot games released by Win A Day Casino. 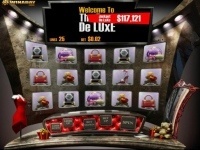 The Reel De Luxe is a 5-reel, 25-payline slot with wild symbol, scatters, 2 bonus features and progressive..
Slot 21 is a Blackjack based Instant Play slot game, with 5 reels and 21 paylines, and a maximum win of the progressive jackpot. 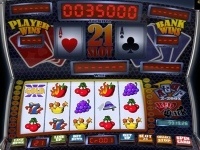 It has symbols that are typical of slots, along with icons like cherries, grapes, and..
China Town has 5 reels and 21 paylines, expanding wild feature, free spins and progressive jackpot. This is an excellent instant play online casino slots game with all the bonus features, bright graphics and great..
Vegas Mania is a 21-payline, 5-reel slot machine game featuring up to 15 free spins, wild multiplier, a wild symbol and a progressive jackpot. 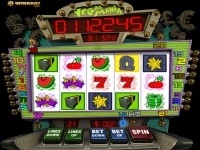 This popular slot game is themed around the fabulous city of Las Vegas. 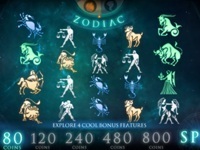 Bet..
Focus on the Celestial, encounter the Elements and root for your sign while playing Zodiac slot at WinADay Casino and win up to 1000x your stake. When you land 3 Suns anywhere on the reels you’ll see the special zodiac.. Tropical Treat is a 5-reel, 50-payline video slot machine game with vibrant video clips and photographs, free spins, 2 wild symbols (including Double Wild 2x win multiplier) and progressive jackpot. There are tropical.. 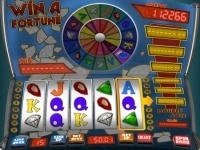 Win A Fortune is a 5-reel, 15-line slot game, reminiscent of the classic game show "Wheel of Fortune", to win a 5-diamond bonus, unlock a treasure box for extra payoff, or multiply your winnings in one of 2 bonus..
Pyramid Plunder is a 5 reel video slot machine with 25 paylines and an amazing adventurous bonus round. Find a map and set off on an expedition to one of the 5 famous Egyptian Pyramids. Tombs full of treasures are..
Lucky Go Round is a 3-reel, 1 payline slot machine game. This slot is a classic single line game that pays players for 8 various winning combinations, and has many extra bonus features (like 10% cashback) to make the..
Busted! is an online slots real money game that is based on the theme of cops and robbers. With a wide range of betting options, a progressive jackpot, and a host of special features, Busted! 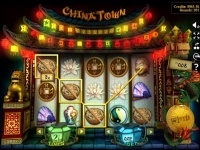 is one of the casino slot.. If you like Captain America, you'll like this online slot game. The game has a full range of symbols from like stars, the liberty bell, a space shuttle and other symbols you can think of that is heavily related to..
Fair Tycoon is an online slots game that is based in an amusement park, it's colorful and fun to play. There is a great chance that you will make good money while playing this exciting game for real money. It has 5..
With good animations, and a number of opportunities for you to win on each spin, this is a very rewarding slot game as well. There are bonus features for those who like some action-filled slots. The game has 5 reels, 21..
Heavenly Reels has 3 reels, 4 paylines and allows you to spin twice for the same bet. You can even hold 1, 2 or all 3 reels. For each WILD symbol hit on any payline, the amount bet on this payline is added to the..
With 3 reels as in the traditional slot machines and an extra reel that is activated only in bonus rounds, there may not be much on offer visually. But, there is certain classic appeal to the graphics and game play when.. The Wheeler Dealer is an 8-payline, 9-reel progressive slot machine game, where the progressive jackpot starts at $50,000. 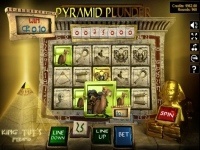 The game features Free Bonus Spin and awesome payouts. Collect six diamonds in the vase and win..
Gold Boom is a 9-wheel, 6-payline slot game that offers free bonus spins, Progressive Jackpot and awesome payouts. Bet max and win progressive jackpot with 3 Gold symbols on an active payline. 3 wild Diamonds activate..
Jackpot Jinni is a genie themed slot game with 5 reels and 18 paylines. 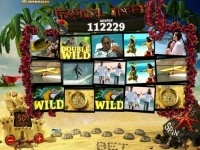 The game features scatter and wild symbols, as well as multipliers and it's very own 3 Jinni jackpots. On the background of the reels, a nighttime..